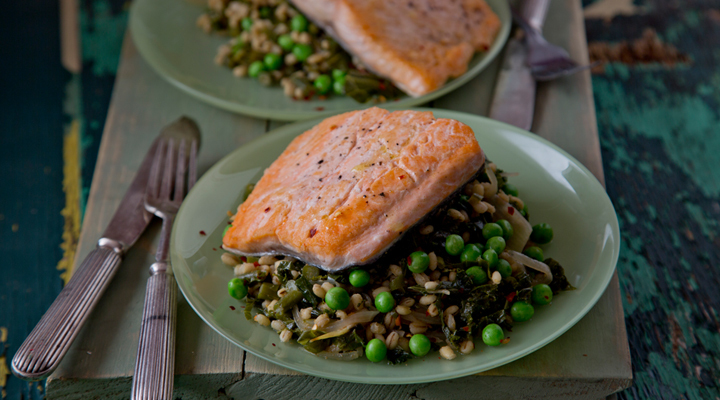 This delicious salmon is a light and easy mid-week meal. 1. Heat 1 tablespoon of the oil in a saucepan set over a medium heat. Add the onion and cook for 3 minutes, until soft and lightly browned, then add the green beans and garlic and cook for a further 2 to 3 minutes. Add the spices and chilli flakes, then stir in the pearl barley, frozen peas and kale before adding the boiling water and a pinch of salt. Allow to simmer for roughly 10 minutes, stirring regularly. 2. Meanwhile, heat the remaining tablespoon of oil in a frying pan and cook the salmon darnes for 5 to 7 minutes on each side. 3. To serve, divide the pearl barely between two plates and sit a salmon darne on top.